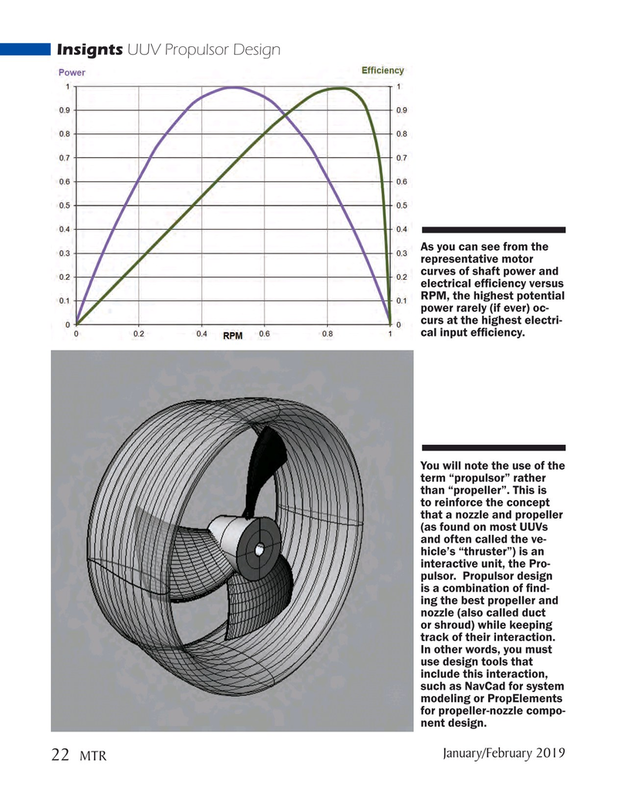 RPM, the highest potential power rarely (if ever) oc- curs at the highest electri- cal input ef? ciency. You will note the use of the term “propulsor” rather than “propeller”. This is to reinforce the concept that a nozzle and propeller (as found on most UUVs and often called the ve- hicle’s “thruster”) is an interactive unit, the Pro- pulsor. Propulsor design is a combination of ? nd- ing the best propeller and nozzle (also called duct or shroud) while keeping track of their interaction. In other words, you must use design tools that include this interaction, such as NavCad for system modeling or PropElements for propeller-nozzle compo- nent design.